CASE Assembly Solutions has complete Surface Mount assembly capabilities that range from one piece prototype assembly to high volume. Our trained staff is skilled at not only quality Surface Mount assembly but also rework and repair of Surface Mount PCB's. CASE Assembly Solutions Incorporated provides through hole assembly services. Our facility is properly equipped to provide the highest quality through hole assembly services. Press Fit Connectors and Odd Form Placement fixturing designed and machined in our in-house CNC tool room. 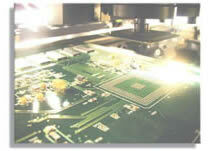 Contact Systems CS-400E component locator machines with CS-740B Just in time inventory system. No one likes to have to do rework to an assembly...but if it has to be done leave it up to the Rework and ECO specialists. Our facility is fully equipped and our qualified staff is capable of performing Rework to any type of assembly. Most contract manufacturers shy away from Rework and ECO implementation jobs, we at CASE Assembly Solutions Inc. focus on these and are happy to provide this quality service. If you required packaging and distribution services then CASE Assembly Solutions can help you. We work with some of the largest shipping companies and provide logistic shipping and distribution services to our customers. © 1998-2019 CASE Assembly Solutions, Inc. All rights reserved.